The Briefing Paper series of the 'Rental housing, climate change and adaptive capacity: a case study of Newcastle NSW' project seeks to provide readers with access to current research on rental sector adaptation to climate change. Briefing Papers produced by the project team are working documents that provide a forum on theoretical, methodological and practical issues related to climate change adaption in rental housing. The publication as a 'Briefing Paper' does not preclude subsequent publication in scholarly journals, books or reports. 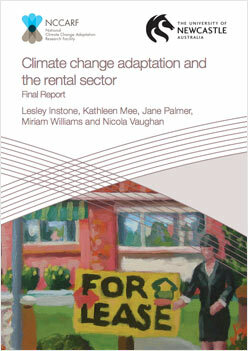 Unless otherwise stated, 'Rental housing, climate change and adaptive capacity' publications are presented as contributions to debate and discussion and represent our developing thinking about the research. We are hoping that they may facilitate feedback from readers, researchers, renters and housing managers.